Texpen speciality paint markers are distributed in Australia exclusively by Australian Warehouse Solutions , and are designed to write sharp, defined, bright marks on any surface. 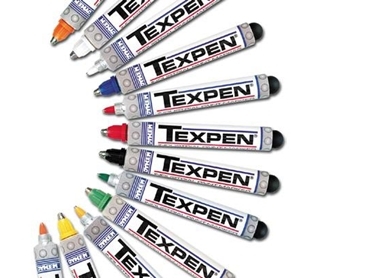 Suitable for use on surfaces including steel, plastic, concrete and rubber, Texpen paint markers feature a stainless steel ball valve action tip that writes through oil, grease and even underwater. Texpen paint markers are ergonomically designed to enable the user to mark at all angles – even upside down. Paint flow is controlled by a pressure bulb at the end of the barrel. Specially formulated paint will mark any non-porous surface while maintaining legibility and brightness, with a tough aluminium body ensuring Texpen paint markers will keep their shape, even in harsh environments.